The Beatles Box of Vision gets UK release | What Hi-Fi? Out in time for Christmas and yours for £82.50, this hefty slab is divided in to three boxes of LP cover artwork, a complete disocgraphy and storage for your Beatles CD collection. 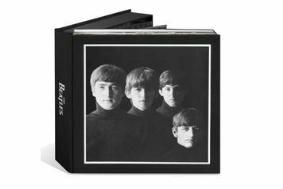 Book One is 'The LP Sized Album Artwork Book' that includes 200 pages of all The Beatles' UK and US album artwork in print size. The book includes front covers, back covers, gatefolds, inserts and more. Moving on to Book Two, titled rather gratingly, 'The Catalography'. This is a new, full colour discography complete with photos, texts and tracklistings for UK and US albums. Lastly, Book Three includes 'The Box of Vision Storage Book', a unique storage case for all 32 discs and sleeves of The Beatles core CD catalogue. For more information on this box set head over to the Box of Vision website.